Will there always be a dividing line between Gospel and secular music? Chapter 5 ‘They Play the devil’s music’. By the age of 7, I had developed an obsessive enthusiasm for percussion leaning more towards the drum kit as I got older. I nurtured and cultivated this natural talent within the spontaneous and competitive music environment of a local black Pentecostal church in West Yorkshire but balanced this out by studying drum notation at extracurricular classes provided by my college between 1980 and 1982. Although I chose to establish myself in a career as a Medical Laboratory Scientist it was not long before I was soon contemplating a change of direction towards that of a professional drummer at the close of the 1980’s. This enthusiam was fuelled in part after attendance at the famous drum school , 'Drumtech', under the direct tutorship of Francis Seriau in Shephards Bush West London. Visits to master classes conducted by drumming legends such as Manu Katche and Billy Cobham also inspired further. In the early 1990’s a serious back injury sustained on the football pitch (which still plagues me to this day) soon forced a rapid change in direction. Great discomfort in the lower back meant that playing drums for prolonged periods of time would be too stressful and soon reflected in the quality of my performance. Reality beckoned, and the fast track career path towards the exciting new life of a drummer was soon erased, but not without a fight back. I turned my attention to teaching, mentoring or ‘coaching’ drummers as I would put it, and it was during this period of time that I established my enthusiasm for writing after designing home-made manuals for my pupils. In 1998 a series of freelance teaching sessions at Canterbury University lead to an interesting discussion with a drum student who was in the process of writing up a thesis based on American Black Gospel music whilst drawing parallels to the UK. He was intrigued and surprised that there did not seem to be a book dedicated solely to the history of Black Gospel music in Britain and wondered if I could help with his research. I promised to get back to him. What initially began on my part as a casual enquiry for such a book in many libraries and bookshops soon developed into what felt like the search for the Holy Grail. It soon occurred to me that I was the person (the only person) that would and should bring this book to life. Motivated by the fact that I seemed to be a lone explorer in what appeared to be unchartered territory I was propelled forward to research, research and research. I went about my task with a sense of geat responsibility, determined to research and produce what would be in effect a template and resource. My journey took me transatlantic to the birthplace of black gospel and I found great comfort in the reference rooms of New York central library and the Schomburg Centre for Research in Black Studies, Harlem. Fascinated by the wealth of information around me, I lost all sense of time on many occasions and was the last to leave the reading rooms after several final calls from the librarian and then eventually security guards. By 2003 I had accumulated a large body of groundwork but for some reason felt and assumed that a niche area such as this would be best served or deposited on a specialist website. My wife Sandra saw potential for my boxes of paperwork and scribbling and after studying my work in detail she encouraged me to make a push for book publication. Her determination paid off and in 2008 a rather excited literary agent introduced me to my publishers and the rest as they say, is history. 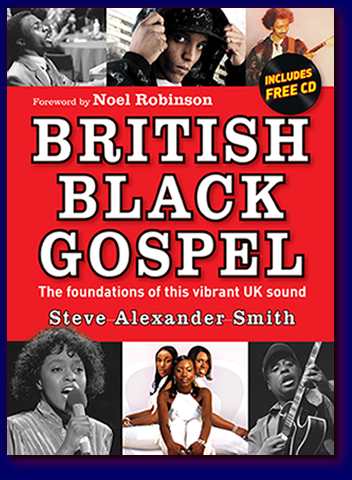 ...Oh and by the way, to the Canterbury student back in 98’ or Post-graduate I would have thought by now……..’Yes, there is a book based on the History of British Black Gospel music’.